Crest Builder set for RM1b GDV project. 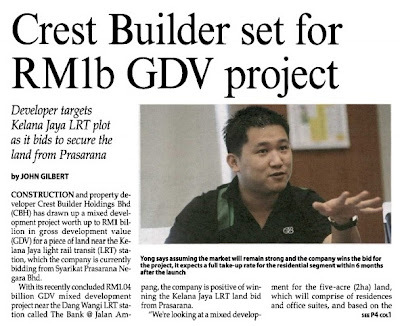 Construction and property developer Crest Builder Holdings Bhd (CBH) has drawn up a mixed development project worth up to RM1 billion in gross development value (GDV) for a piece of land near the Kelana Jaya light rail transit (LRT) station, which the company is currently bidding from Syarikat Prasarana Negara Bhd. With its recently concluded RM1.04 billion GDV mixed development project near the Dang Wangi LRT station called The Bank @ Jalan Ampang, the company is positive of winning the Kelana Jaya LRT land bid from Prasarana. “We're looking at a mixed development for the five-acre (2ha) land, which will comprise of residences and office suites, and based on the current market trend, it would be about RM1 billion in GDV. “Assuming the market will remain strong and we have secured this project, we are looking at a full takeup rate for the residential segment within six months after the launch,” CBH ED Eric Yong Shang Ming told The Malaysian Reserve in a recent interview. Based on previous development, he said the commercial segment will be “a bit slower” and the take-ups will only be towards project completion. “We expect the decision making by Prasarana for the Kelana Jaya mixed development project by year-end,” he said. CBH signed a joint land development agreement with Prasarana in April to build a retail podium, small office flexi office, office suites and luxury serviced apartments for the Dang Wangi project. Prasarana will receive 21.2% of the total GDV in a combination of cash payment and completed units. Physical work for the development is expected to start by the second-half (2H) of this year and targeted to be completed by December 2017. “We are looking at a different market for the 2.7 acres Dangi Wangi project as we are looking at a more international market, ideally between 30% to 40% international buyers and the balance of 30% for open market," he said. On foreign workers, Yong said the company’s dependency on foreign labour was comparatively less than other companies, although he agreed with Master Builders Association Malaysia’s push for preapprovals for foreign skilled workers. “We have been using the same team of contractors for the past 10 years, and we are not so much affected by the shortage of workers,” he said. For the 1H ended June 30, 2012, CBH posted a net profit of RM26.9 million on the back of RM176.1 million in revenue. Its 1H net profit was up almost threefold mainly due to the change in the fair value of investment property in the second- quarter, the company said in its filing.